If the video doesn’t work for you, feel free to proceed to the printer-friendly version below, or go directly to a fine kettle of ish on YouTube. *If you choose to make this low-carb or gluten/diabetic safe, you may need a second stop to pick up shirataki noodles. Let’s be honest – nothing is every going to replace the toothsome chew of a great pasta, but for those of us who choose (for many reasons) to reduce or eliminate flours from our diets, shiritaki noodles are a great choice to fill that pasta-shaped hole. Read more on shiritaki here here or check out the House Foods website for retail locations. If your shrimp are frozen, put them in a strainer to thaw. 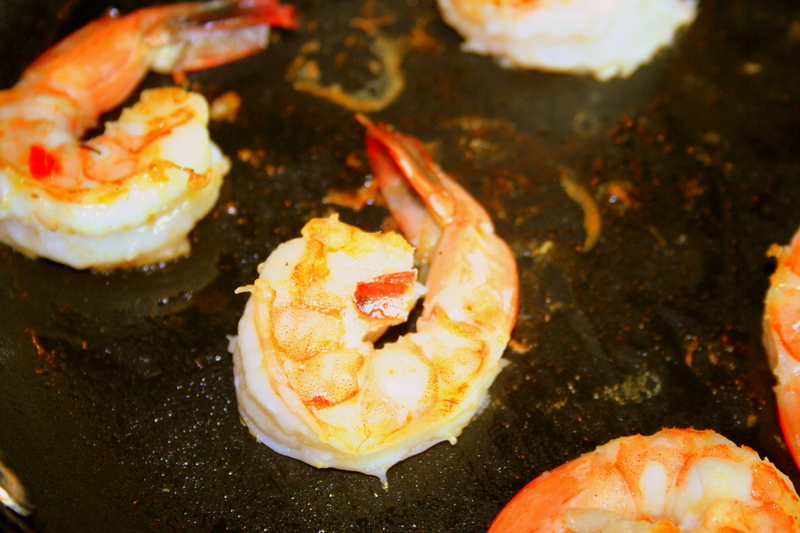 Since we’ll be searing these, the shrimp need to be completely thawed before you cook them. If they haven’t been peeled or deveined, do so once thawed. Rinse. Chop garlic and cilantro and set aside. If you like more garlic or cilantro, go ahead and dial up the amount you’re using. Cut feta into approx. 1″ cubes. You want a medium dry, sharpish, not-too-salty feta – Greek or Bulgarian is a good choice. Most French feta or products simply labeled “goat cheese” are a bit creamier than you want for this recipe. Drain oil from sun-dried tomatoes and reserve (yields about 1/4 cup). Pre-heat your pan over medium high heat. Add .5 tbsp of the oil from the tomatoes to the heated pan. 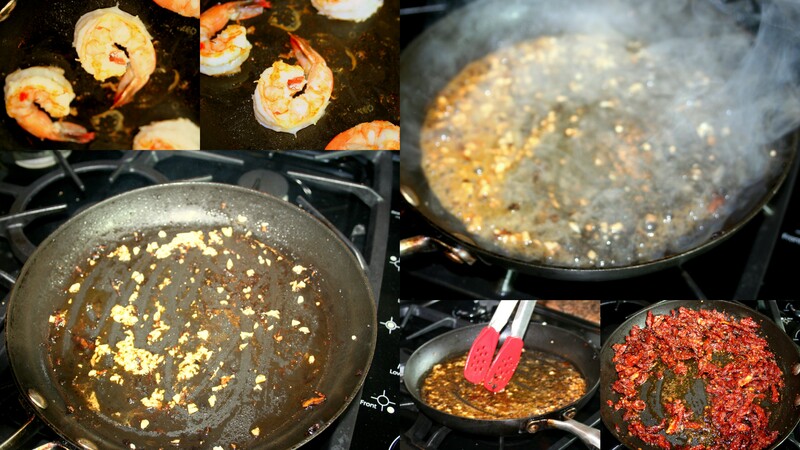 Sear shrimp in 3-4 batches, adding an additional .5 tbsp oil and heating pan prior to each addition. This is a *patience required* step, like letting your cakes cool all the way before you frost them. I know, I don’t like it either, but cooking in small batches and not overcrowding your pan lets the pan stay good and hot and allows the food to develop a nice sear. Add too many, and your pan will cool off and get full of liquid, which pretty much boils or steams your food, rather than pan frying it. Once the shrimp are done cooking, reserve the pan with shrimp fond (the yummy brown bits stuck to the pan) for making the sauce. In other words, don’t wash it yet! 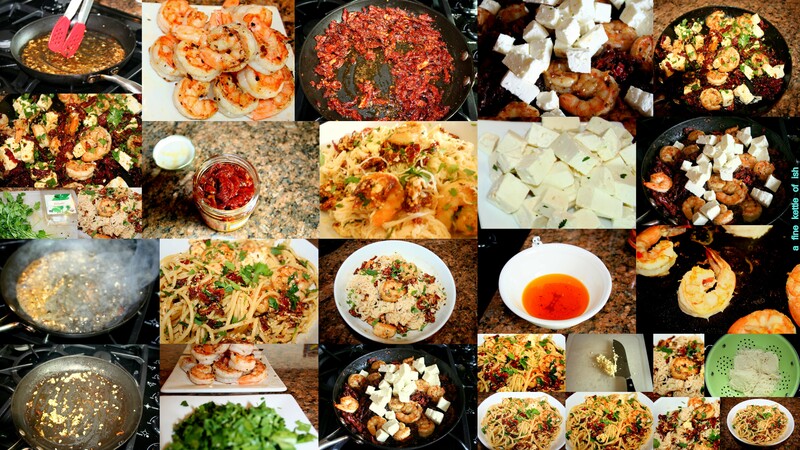 Set the shrimp aside with the cilantro and feta until its time to assemble the final dish. If you are making these ahead of time, you can stop here, bag everything up, and start again at Step 3 as much as 24 hours later. If you are taking a break in between steps, or you accidentally wash it before you make the sauce, please come over to my house and wash my dishes too. Or just use a clean pan in Step 4 – things will come out *almost* as good. If you are using shiritaki noodles, start them draining now. You may notice what the package optimistically calls an “authentic odor” – this is normal and not reflective of the actual taste of the noodles (they don’t really taste like anything). Boil a pot of water and prepare the shiritaki or pasta according to package directions. You can start the sauce while you’re waiting for the pasta to cook! Capellini cooks very quickly and the shiritaki only requires parboiling, so just keep an eye on them if you’re multi-tasking so the noodles don’t overcook. Drain noodles and set aside while you finish the sauce. Put your pan back on the heat, add 1 tbsp tomato oil, add garlic, and cook on medium high until garlic is just starting to brown. Add 2 tbsp white wine or dry vermouth (if you don’t like to cook with alcohol, use chicken or vegetable stock), scrape the brown bits off the bottom of the pan with your stirring implement, and turn the heat down to low and cook until reduced. 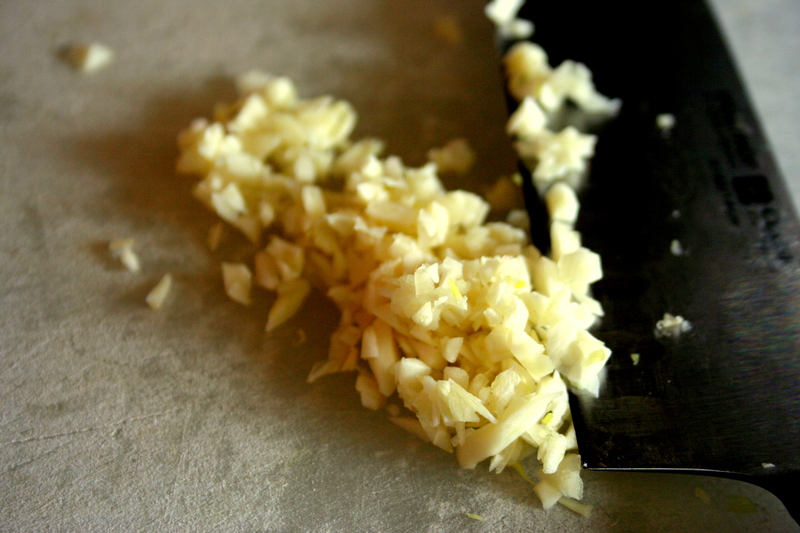 If you cook the garlic too long and it burns (gets very dark brown or black), just toss it and start over – it gets a strong bitter flavor when it burns. Add the tomatoes and continue to heat on low until warmed through, about 5 minutes or so. Next add the shrimp to warm through, 1-2 mins. 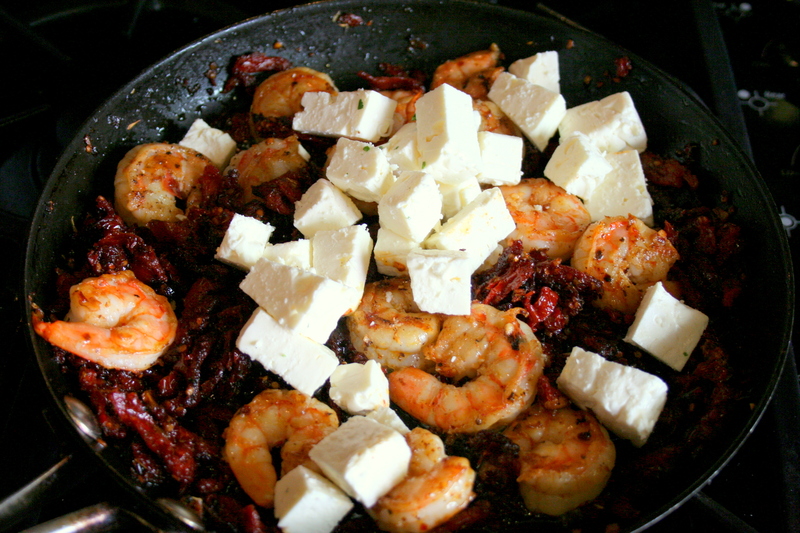 Add the cubed feta to the pan, toss, and turn off heat. The feta should get soft and a little melted, but still be in recognizable cube form. Add the cilantro, reserving approx 1 tbsp, and toss mixture with salt and pepper to taste. Add your drained pasta or shiritaki to a large pasta bowl and toss with sauce. Top with reserved cilantro and serve. – Vegetarian: Omit shrimp, skip step 2, add 1 tbsp grated parmesan and red pepper to plated dish. – Side Dish: Omit shrimp, skip step 2, add 2 TBSP chopped garlic to sauce in step 4. Great paired with garlicky chicken or beef, serves 8-10 as a side. 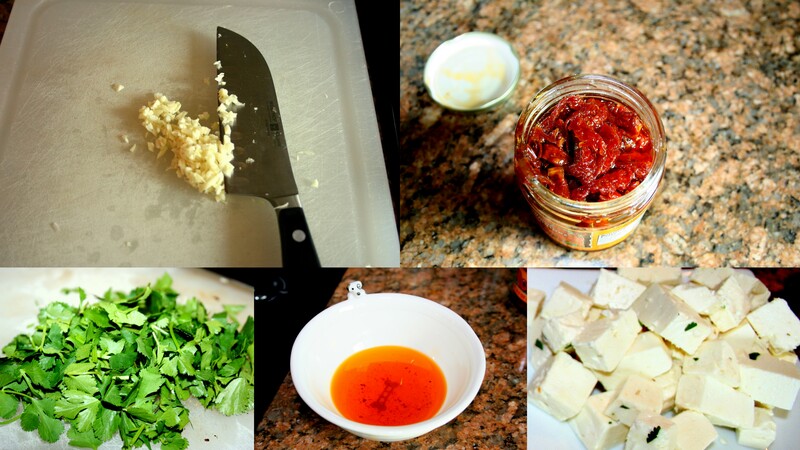 – Reduced Fat: Decrease oil and feta by half, add 1 tbsp grated parmesan and red pepper to plated dish. 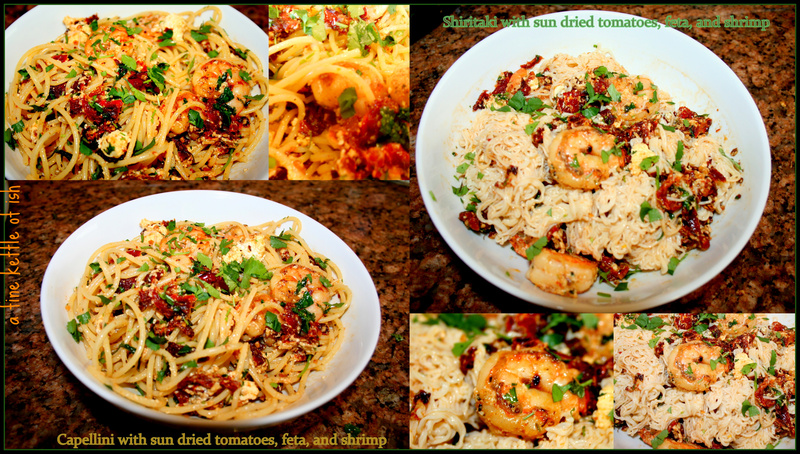 – Reduced Carb: Omit pasta/shiritaki, skip step 3, reduce tomatoes by half. Cover platter with 4 cups raw baby spinach, microwave 60 seconds, top with sauce and let stand 3 mins. Top with toasted pine nuts and grated parmesan. Readers, take a look at the video version and let me know what you think – helpful? easy to watch/understand? too slow and kind of annoying? Doesn’t display right and you don’t want to click over to Youtube? Inquiring minds want to know! I’ll continue to post the more printer-friendly version as well for now. It’s garlic go time, friends!